The UK's most legendary comedian and actor – Mr John Cleese is coming LIVE to NYCB Theatre at Westbury on Thursday 21st November 2019! Bringing his hilarious and easy flowing comedy skills to the stage this coming Fall, John Cleese is heading out on tour to give his fans an evening they won't soon forget! North America look out and prepared to non-stop laugh all night as John Cleese heads on down to the NYCB Theatre! Tickets are now on sale… book yours while you can! John Cleese hardly needs an introduction as one of the most famous English comedians of all time. With his work across the board, within film, TV, stand up comedy shows, screenwriting, voice acting and producing, this comedy star has taken the world by storm ever since he first started his career all the way back in the early 1960's. His most famous work includes the Monty Python's Flying Circus which became a successful sketch show and a legendary performance within the UK. John Cleese starred in the show himself, along with co-stars Terry Gilliam, Eric Idle, Terry Jones, Michael Palin and Graham Chapman. Together they created four incredibly funny Monty Python films: And Now for Something Completely Different, Monty Python and the Holy Grail, Life of Brian and The Meaning of Life. Moving on from the Monty Python films, John Cleese of course had to continue to make another kind of TV sitcom and this is when Fawlty Towers was born. Since its release it's become as famous as memorabilia as a throwback performance that made fun of the working hotel and restaurant scene, with everything going wrong, in the hilarious way that only John Cleese could pull off. The series featured his first wife who also co-wrote the script for Fawlty Towers and starred in the show. Other actors that were featured include Prunella Scales and Andrew Sachs. With it's ever-growing success, it attained the 1980 BAFTA award and was included in the British Film Institute's list of the 100 Greatest British Television Programmes where it went straight to the top! 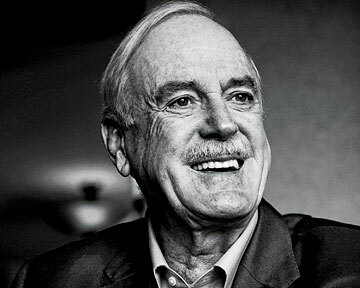 John Cleese has continued throughout the years to stay at the top of his game, with these hit shows under his belt, he went onto continuing his acting skills in movies such as Clockwise, James Bond, Harry Potter and in the three Shrek blockbuster films – where he played Princess Fiona's father who later gets turned into a frog. John Cleese has also produced and written some incredible movies that you just wouldn't know unless you are a big fan of his work and know of his specific comedy style. These selected dates available, include the special chance for lucky fans to meet the actor/comedian with VIP passes. Come and catch the wonderful comedian in his full glory – who knows if this opportunity will come around again!